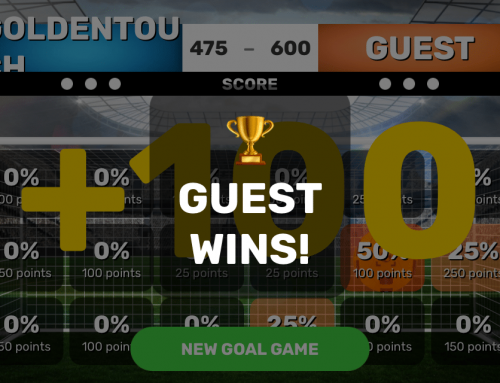 1000 Touches, again!!?? Sound familiar? How can you get your youth soccer team excited to get their 1000 touches at the start of each practice? Even better, how can you help your youth soccer players want to work on their foot skills when they’re not at practice? Let’s be honest, most kids aren’t jumping up and down to work on their technique. They just want to get on the field and play- not work on toe touches, step overs, pull backs, scissors, sole roles, chops, inside/outside, roll overs or whatever other technical training you’re asking them to do. After you’ve been around coaching for a while you realize how important that technical development is at a young age. Back when I started coaching kids there was one youth team who always ran circles around us on the field. After a game we started chatting about how good their players were and the other coach mentioned their heavy emphasis on foot skills training. Hey guys, need your coaching expertise. My son is on a U8 soccer team and we do 2 practices a week. We’re looking for some good foot skills drills. We’ve been doing the same few each week and the boys are starting to get bored of them so we’re looking to add more into the mix. Can you recommend some good foot skills drills? And maybe a book/website/video/etc that’s a good resource for drills? Are they doing the 1000 touches drill to start practice? It’s also crucial that they find games where they start applying those skills in small sided games. Settings where competition is presented and lots of positive feedback as the skill is new to them. The best way to teach all those things is to play lots of 3v3 or 4v4. At younger ages skills are super important and as they grow older they can learn about other aspects of the game. After that email we started doing some version of the 1000 touches drill at the beginning of every practice. Starting out with 1000 touches not only got them more comfortable with the ball, it also got them warmed up for the training session. Their first touch got a little better so they were able to get control the of the ball sooner and have more time to make decisions. When they got into tight spaces they got a little better at keeping possession of the ball. Since they could keep the ball closer to them they were able to either weave through defenders to beat a line or change direction and escape pressure. Their confidence in their ability to hold the ball under pressure went up so they were less likely to panic and just kick the ball away. They had more luck with 50/50 balls. After either going in for a tackle, or getting tackled, who knows where the ball would end up. Since they were better able to use all parts of their feet, it was easier for them to recover the ball after the tackle no matter where it ended up. Being comfortable with the sole of the foot, the inside, laces, or outside of the foot gave them more options to coral the ball after the tackle. The ability to use both feet improved. It wasn’t like they were taking shots with their weak foot all of a sudden but the 1000 touches drill puts an emphasis on using both feet so players starting getting more comfortable handling the ball no matter what foot it ended up on. With all these benefits why wouldn’t you do the 1000 touches drill as a coach? Well you probably won’t be surprised to hear that starting out every practice with 1000 touches of ball work wasn’t very exciting to 8 year olds. Although we saw all the benefits of the technical ball work the kids weren’t very excited about it. We persisted through the season and even though there was grumbling from the players the player development gains that came with it were worth it. Of course just going through the motions of the 1000 touches doesn’t really have the same impact as working hard through the soccer drills. As a coach its our job to get every player putting in their best effort at training. As players get older and more interested in improving they naturally tend to work harder in the foot skill drills but the younger ages can be a challenge. When you have a group of 8 year olds going through the drill you’ll see that some of them have faster toe taps, harder sole roles, quicker pull backs, and bigger chops than others. The way we did the 1000 touches drill was by time. We’d tell them and show them the next move to work on and then start a timer. Depending on how hard the kid worked, some of them would get in 50 touches for that specific skill move during the time and some wouldn’t. Have players count in their head how many touches they get for that drill. Then run it again and see if they can beat their previous number. At younger ages its good to give them less time the first round and more time the second round so most kids will have success in “improving” and be motivated to continue. If you have a team where the players are all around the same skill level you can also have them compete against each other. See who can get the most touches out of the team. That doesn’t work well for teams with a big disparity in skills because the more developed kids always win and the less developed kids get discouraged. One thing that’s worked really well with the younger ages is to have players lead each foot skill. For example, with a group of 6 year old girls I coach we pick a different girl to lead each foot skill. To be chosen as a leader you have to be working hard. All the girls want to be a leader so they work hard in a drill hoping to be chosen to lead the next drill. 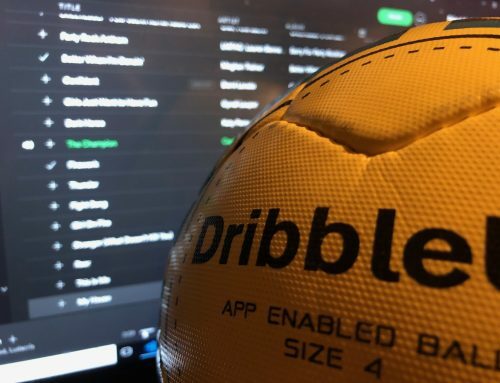 After going through the 1000 touches with several different ages of kids and now being introduced to the Dribble Up smart soccer ball we finally landed on the perfect way to implement the drills for youth soccer players that not only gets them the touches but also gets them excited to do it. After each training session we choose the player who worked the hardest and award them “Practice MVP”. With that honor, they get to take home one of the team Dribble Up balls and through the coaches dashboard we assign them 2 new foot skills to learn. This is great for motivation because it gives kids a reason to work hard at training. 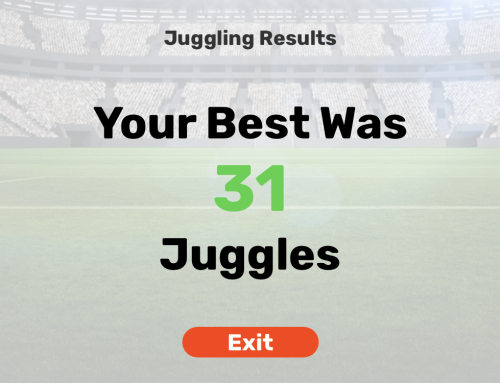 You can also do something similar with games and give away the game ball to the player who worked the hardest or who used things in the game that you’ve been working on at practice. As you probably know as a parent, young players are really motivated by technology so they’re excited to be the one to use the smart ball for the week. The honor doesn’t end with taking the smart soccer ball home though. 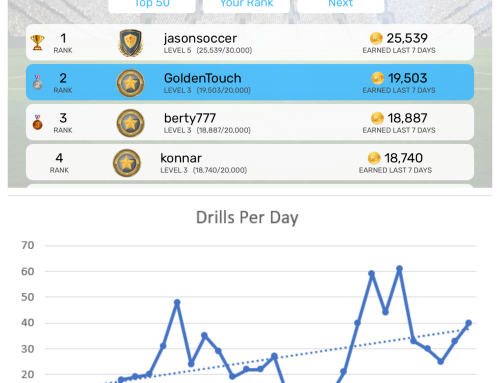 We assign two new foot skills and that player uses the Dribble Up app that week to learn and practice the moves. At the next training session that player brings back the Dribble Up ball and leads the team during the 1000 touches drill and demonstrates the new moves. We like this because it gets that player working on foot skills at home outside of practice and it gives them ownership of the moves, having to demonstrate them to the team at training. Motivates players to work their hardest during technical training rather than going through the motions. Give players a visual reminder during training. The Dribble Up ball is brightly colored and patterned. A constant reminder that who works the hardest gets rewarded. Reward ties directly into further development. The players that are rewarded for working hard get additional touches at home with the smart ball. Adds new moves each week into teams technical training. Gives coaches a progressive way to work on playlists. Rather than have the kids try to learn all the moves in the 1000 Touches drill at once we’ve created a playlist that introduces the skills to them several at a time each week. One thing we discovered when trying to run youth soccer players through the 1000 Touches drill is that it can be discouraging the first time they’re introduced to the drill if they try and learn every move all at once. Imagine you’re a kid and your brain is telling your feet to try a new foot skill but your feet just won’t do what you’re asking them. As you keep trying the skill you start to improve but are still pretty frustrated. Then your coach says to move onto another skill you don’t know and you go through the same experience. Then again, your coach has you move on…. you can see how the level of frustration and discouragement could grow as a coach continues to introduce new skills that a player struggles with. As an alternative, if we introduce just two new skills each training session the player can spend more time on them and improve their ability and confidence. Make sure your drill duration is long enough for your target age group. U-8 players players are going to be able to get in a lot fewer touches in 30 seconds than U-12 players. If you’re in doubt it’s better to make it longer than shorter so the players have time to settle into each foot skill and get in enough touches. Test out the duration separately for each age group. It works best if you begin the playlist with the simplest skills. This lets the players get into a rhythm and have success before introducing new skills. This means the first few sessions you’ll spend the bulk of the time just on a few skills. Only introduce a few news skills each session. As you progress from practice to practice the durations of the skills you’ve already learned shrinks and you’ll cover a lot more skills each time. The largest amount of time will be on the new skills you introduce. Since we want them to be able to use the left and right foot we use both “Left Foot…” and “Right Foot…” drills. It’s better to lead with the strong foot first in the playlist so they learn the move with the foot they’re most comfortable with. Of course most teams have a range of skill levels across players so it’s good to have an extra skill or two handy each week in case you have some kids are ready to move on before others. Chances are a kid will eventually forget to bring the Dribble Up ball back to practice so it’s good to have at 2-3 balls so you have at least one as backup for the “Practice MVP” for when next player when the previous kid forgets to bring it back. After spending a lot of time crafting the playlist we decided it would make sense to offer it as an option to other coaches who are looking for ways to incorporate more technical training into their practice and also to motivate their players to spend more time on the ball. If you’re interested in trying it out shoot us an email to touches@soccerstripes.com . Here are some pics of the 1000 Touches playlist in action.